Does a desk count as hardware? Galahtech | Computing | Computer Hardware | Topic: Does a desk count as hardware? The desk is complete, maybe. One fear I have at this point is it will be too heavy to raise with my monitors and whatnot on it (kinda heavy already) so I bought a scissor jack that I'll use to crank it up and down... however, that jack alone doesn't seem to raise high enough (even though the box says it should) so I might get two, and stack them They wont be for support or anything, just a helping hand to raise and lower. 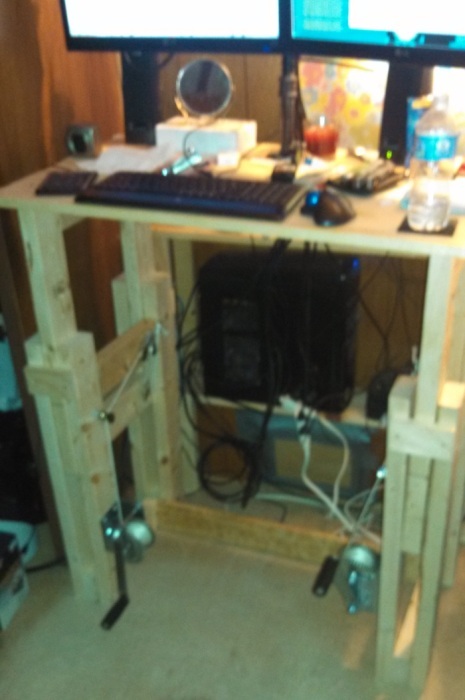 Re: Does a desk count as hardware? 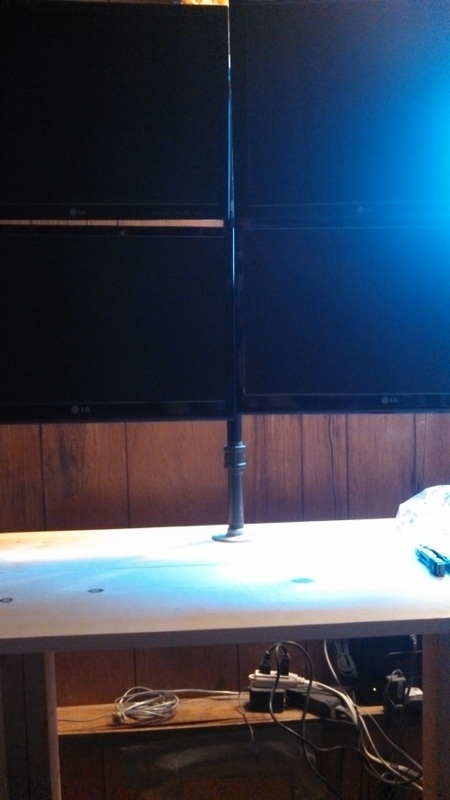 First, I need a longer monitor cable for one of my monitors, it should be here Monday. Another issue I am having is the PC is in my way... in the last picture, it is crowding my leg space and I can't put the chair under the desk... as of this posting, I have it turned side ways and against the wall, but I'm kicking it a lot as it is crowding my foot room I'm thinking of building some shelves behind the desk, which would give me some 'storage' and also a place for things like router & modem that don't need to go up and down... but it would also push the desk further into the room. 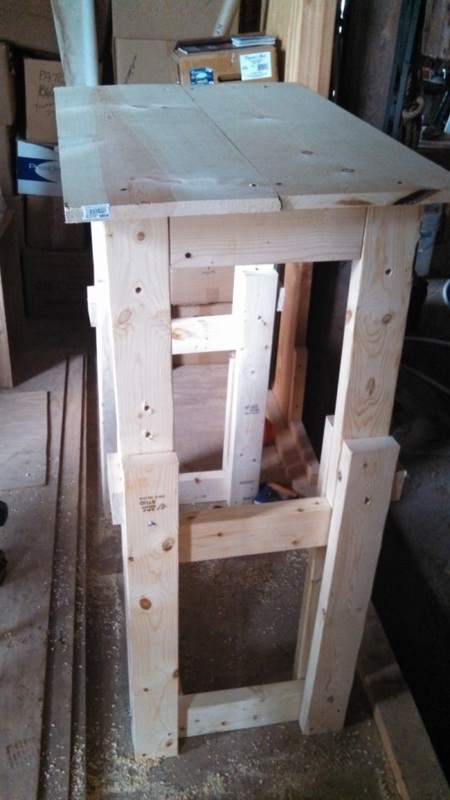 c. double stacked bottle jack - might not be safe, since double stacked, it gives 2 points for them to 'kick out' and I might need to build some sort of guide/frame to prevent that. 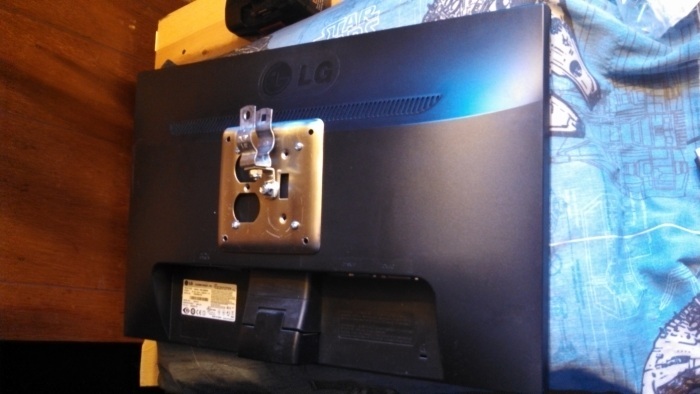 Issue: I like the multiple points of articulation, the older monitors want to "roll under" and I fear with all the vibration of going up and down that they will not stay put. Edit: just ordered 2 20" asus monitors, they have speakers but were much lighter than anything else in that size/price range. 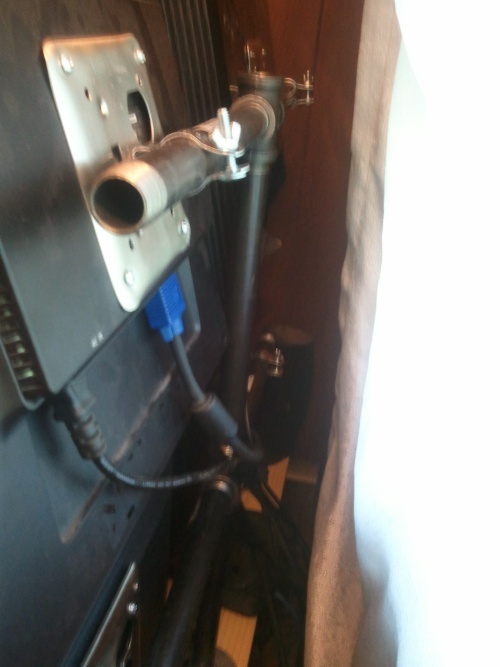 Issue: PC sharing space with leg/foot room, modem & router don't need to remain on desk (and their cabling might be an issue). a. Shelves behind desk - pushes desk further into room. Or maybe look at putting some sort of block-and-tackle system so you can lift it. That's a pretty interesting thought... 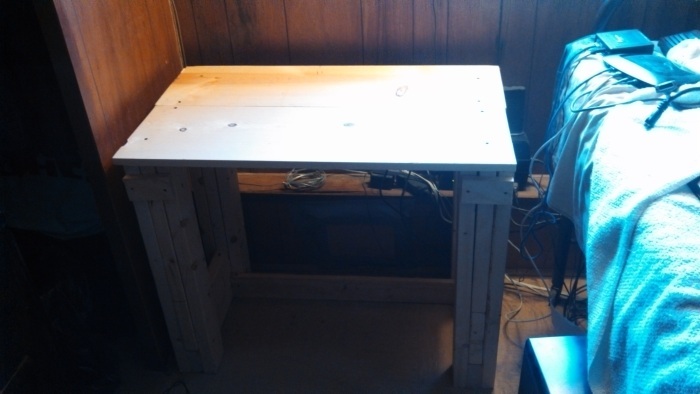 I could "extend" the legs upward, then attach rope or something to the desktop. The "frame" for that might make me feel boxed in though. 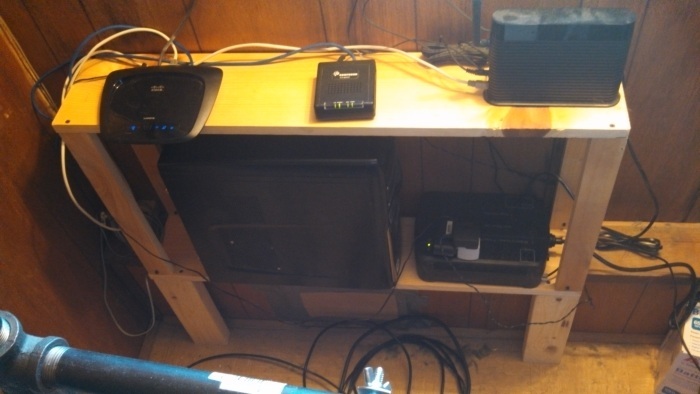 Here is the "shelving" I threw together to get my PC out of my foot/leg room, which also solves the modem/router placement issue. 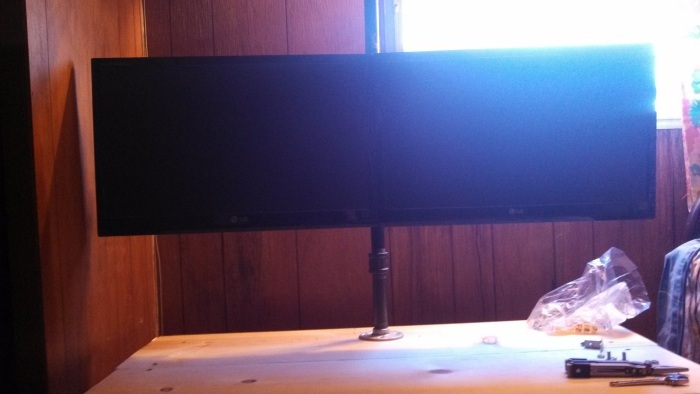 Also bought two new monitors for the secondatry pc (top) they are a little smaller (20", replaced a 22" wide and a 19" square) but the picture is much brighter & sharper, so I can actually read them better. That computer is usually only for testing in odd browsers and running a web server when I need to work on .dll's without affecting the live server, both via VMWare. I'm waiting on a longer cable for one of my monitors, and some cable management bits ('reusable' zip ties and zip tie mounts) so once I get all the cables under control, I'll revisit being able to adjust it. 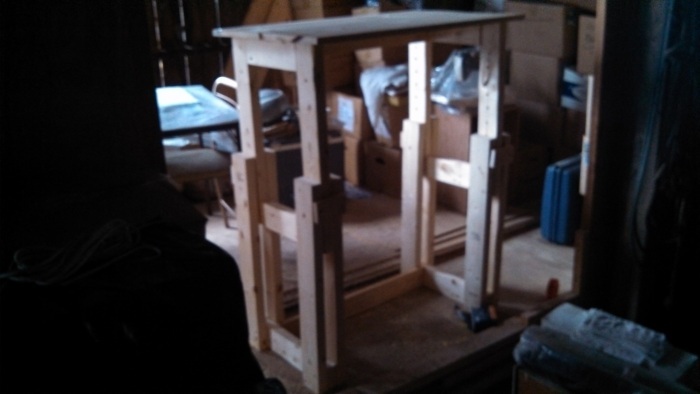 1) I need to mount it closer to the back, because that is where weight is and the top wants to pitch back. 2) I need to mount the top bits to the upper outside of that board, where it is now I am just not getting high enough before the pulleys meet. Looks good. 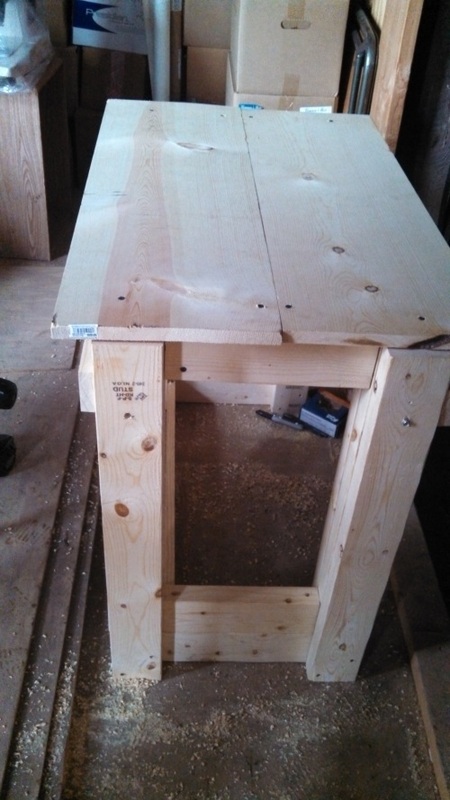 Also maybe the problem for the table tilting back would be better handled with some sort of counter weight? I'm not sure how that would work though. Don't look back. Look in the mirror to look back. I had a slight issue with the monitor height being pretty different from sitting to standing, meaning my eye:elbow ratio was changing. 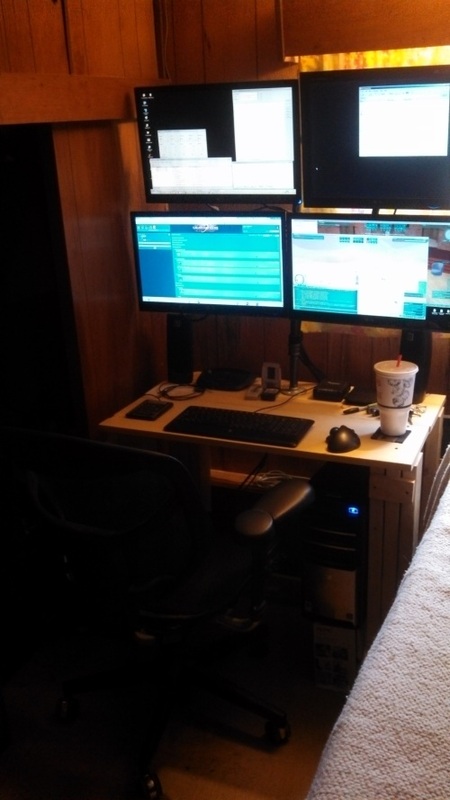 That brought my attention to the fact that I sit like I'm in a recliner So I raised my monitors up, forcing me to sit up... 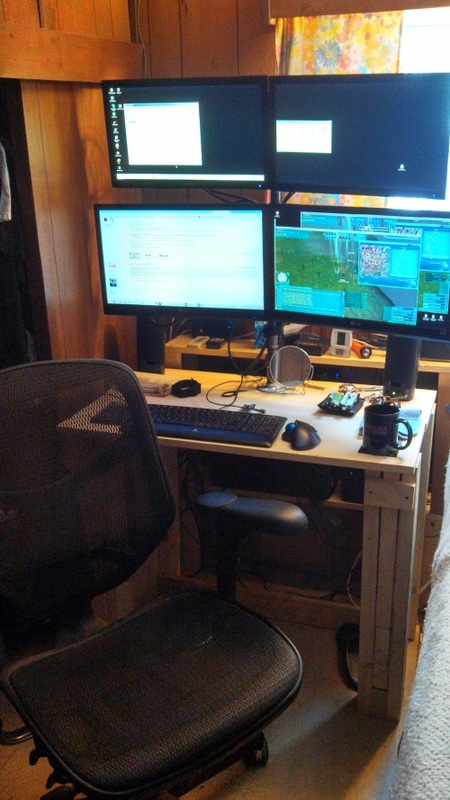 In doing that, I got frustrated with trying to get my 'custom' monitor stand to put the monitors exactly how I wanted so I've given up on that and have a "real" quad monitor stand on the way. 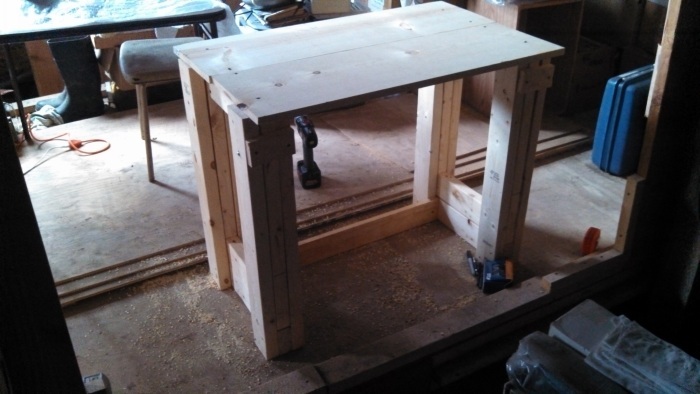 Now that I think I've figured out all the ins & outs, I think i'm going to build another version of my desk. I could just modify this one, but that leaves me w/o a desk (and therefor computers) while I'm doing it. I think I've found solutions for all the issues I had, and I'll be sure to get MY tools that I need out of storage so that all my cuts and joints are accurate. 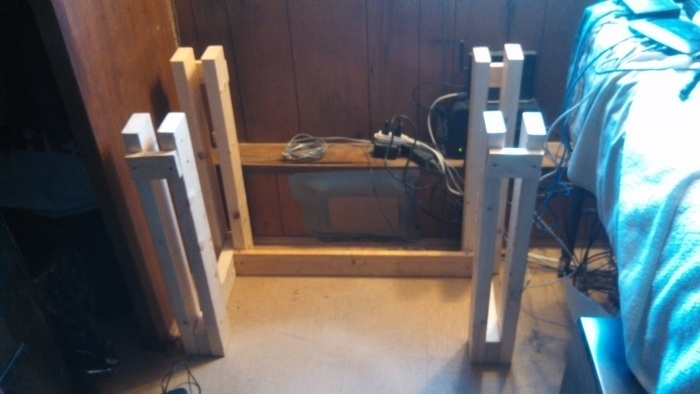 I came up with a solution for the top section wanting to tip backward, I'll add a piece of 2x4 on the outside (of the sides) of the bottom of the top "leg" that will fill the space between the two legs of the bottom half, so the bottom legs for a track for it to go up & down. 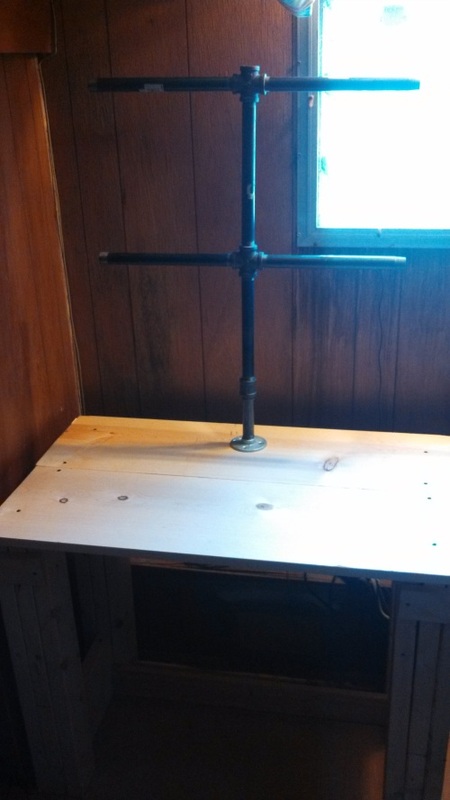 That piece will also serve as a place to mount the lower pulley, and I'll move the block & tackle and wench setup to the outside of the desk. 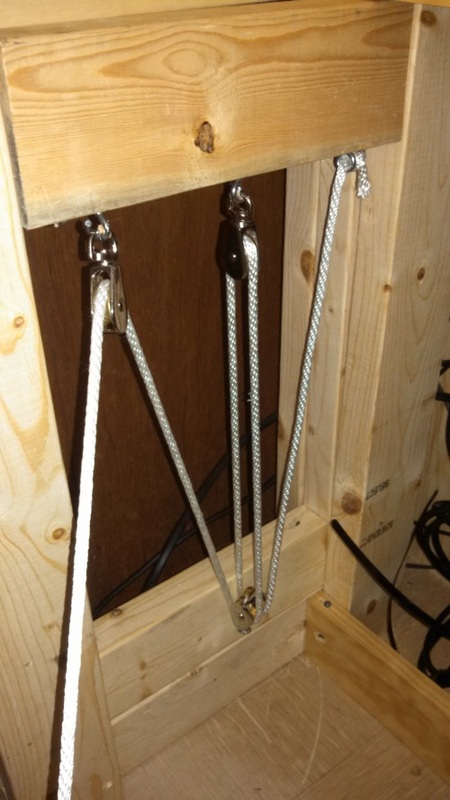 I'm still unsure if the block & tackle works better with the top pulleys spread out or grouped together though.